Children's Book Review by Susan Stephenson, www.thebookchook.com Check out more by clicking on the right side bar, Reviews button. When my son was younger, he loved Where's Wally and other visual puzzles. He would have spent many pleasure-filled hours with Where's Wally? 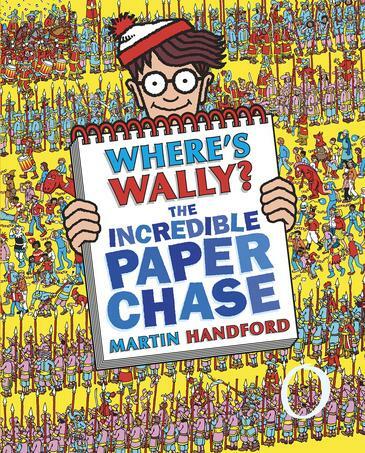 The Incredible Paper Chase by Martin Handford, published by Walker Books (2009). It's the seventh classic title in the Where's Wally? series. This book not only has the usual incredibly detailed pictures to pore over, but also includes a board game. The cards in the game involve kids in reading, and the fact that they are tongue twisters will have kids giggling in no time. I really like the humour in all of the Where's Wally? books. There are so many visual gags to make kids and Book Chooks chuckle. The fact that each scene has hundreds of fascinating details invites kids to both share and discuss the book with their friends. They'll look for the given characters and objects on each page, at the same time as collaborating, taking turns, asking questions, hypothesising, inferring, analysing and problem solving - a lesson in thinking dressed up as fun! 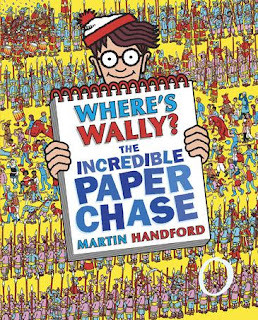 Parents and teachers could extend the value of this or any other Where's Wally book by using it as a model for children's own creations, or a joint family book. Bird-loving children could make a Where's Willy? book featuring Australian birds like the Willy Wagtail. Or Where's Wombat? Forget alliteration and try a book called Where's Kyle, with photos they must find themselves in. You could add different family members or fantasy creatures by using a photo editing program. According to the Walker Books website, the "Where’s Wally? books are a worldwide phenomenon, selling more than 50 million copies worldwide and published in over 30 languages, including Egyptian, Korean and Hebrew. Wally has reached celebrity status; such is his popularity that he has appeared in the primetime American TV shows Frasier, The Simpsons and Friends, as well as on the 1000th anniversary cover of Rolling Stone magazine as a cultural icon of the last 40 years." It's amazing to me to think that the ever-smiling guy in a red and white striped beanie who entertained my son almost 20 years ago has sold over 50 million copies worldwide. I hope Wally will continue entertaining and entrancing many generations to come.